An alternative fixed income asset management firm. Dynamic Credit manages (securities of) loans of others and its own proprietary direct lending. Founded in 2003, Dynamic Credit has offices in Amsterdam, New York and Jakarta. Dynamic Credit is an alternative fixed income asset management firm. Founded in 2003, Dynamic Credit has offices in Amsterdam, New York and Jakarta. Dynamic Credit manages (securities of) loans of others and its own proprietary direct lending. The team of experts at Dynamic Credit has extensive experience valuing, sourcing, creating and managing alternative fixed income products. 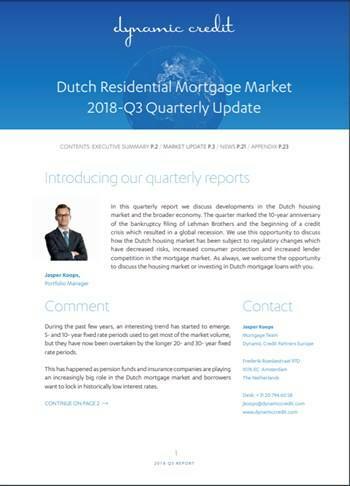 In 2015, Dynamic Credit set up the first online mortgage distribution platform of the Netherlands (bijBouwe). In June 2016, Dynamic Credit launched the LoanClear loan portfolio surveillance platform and marketplace. In August 2017, Dynamic Credit launched the Dynamic Credit Funds ICAV, an Irish AIFM regulated fund umbrella. Dynamic Credit is organised along product lines: ABS & Corporate Credit portfolio Management, Alternative Fixed Income Advisory, Dutch Mortgage origination and management, Loan Investment Services, Indonesian direct lending and New Strategies. Within those product lines experts focus on investors, borrowers and software development. The Key Functions people (like legal, compliance, risk, talent management, finance, office management) make sure the organisation can do its job well. A fast-paced environment: things happen at Dynamic Credit, and they happen fast. Buckle up for an interesting ride! People joining Dynamic Credit should fit in the DNA: entrepreneurial, challenging, fast-paced and inclusive. The hiring process is designed to make sure that the match is there. To make sure you can really get to know Dynamic Credit and the role and for us to thoroughly get to know you. Op dit moment heeft Dynamic Credit geen vacatures geplaatst op Hypotheekcarriere.nl.